The skid marks from a a big green jump standard on Jordyn’s helmet. I knew it was bound to happen, that it was just a matter of time. Piper, Jordyn’s new South Carolina ride, is a cute pony and a nice mover but still pretty green. While she is not overly spooky or difficult to ride, she is a little inexperienced. I think we ended up being good owners for her as Jo can ride her but the pony still needs instruction, which Lauren can give her. Jo had gotten pretty used to heading to ring with horse Mickey and trotting for an hour or two. Sometimes fast and sometimes slow, Mickey was not interested in breaking into a canter with his young rider. Piper, on the other hand, is not so laid back. I figured if Jo kept taking her faster and faster at the trot it would just be a matter of time or weather or barometric change that gave Jordyn her first taste of a canter off the lounge line. I didn’t have to wait too long. Friday night, it was Jo and I at the farm. Everyone had come and gone for the day. I was working on some stuff at the barn and Jordyn had headed to the arena to ride. About 30 minutes into their ride, I heard a terrifying yell and looked over to see Jordyn and Piper cantering around the arena. This would have probably worked out okay as Jordyn was sitting the canter very well and Piper was not misbehaving, at least not passed cantering when she was supposed to be trotting. But Jordyn was pretty freaked out. She continued to scream and periodically pull the reins back but Piper was responding more to the screams than the reins. I was unable to do anything but watch them canter around. Anyone who has ever ridden knows the canter is much easier and comfortable to ride than the trot, but it is way faster, a preamble to a gallop and a run. Jordyn has not discovered the joy of the canter yet, just the fear of going fast. Finally the pony made a sharp turn at the end of the arena and headed straight for the big jump at the center. I yelled at Jo to turn her away from the jump. I have no doubt this little, talented pony would have jumped the three-foot jump if Jordyn had not moved her away from it. 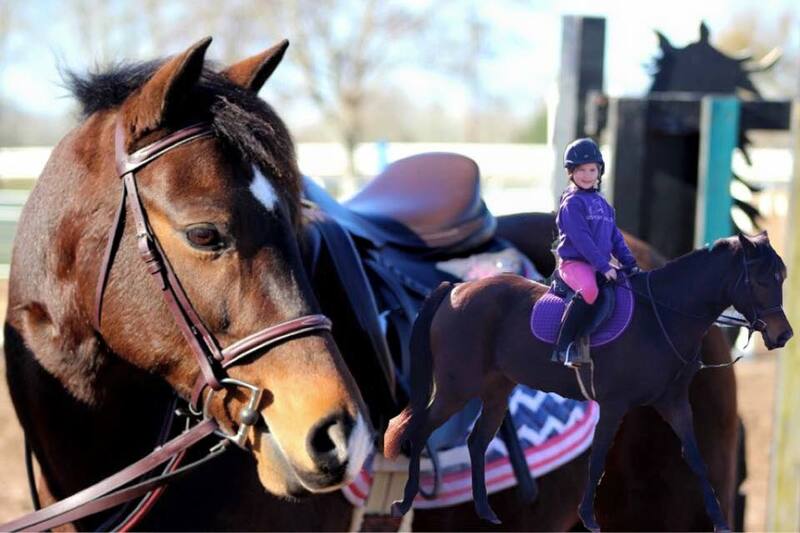 Jordyn tugged at the reins and the pony swerved to the edge, knocking Jordyn off-balance and swinging her head directly into the heavy, green jump standard. There are moments that stand still in your life and this was one of them. I knew she was not dead as the screaming had continued in earnest. Sneaky, our Corgi, (she says she is a doctor) and is extremely compassionate, got to Jordyn on her short legs before I did. I would just like to say that while Sneaky gave Jordyn many encouraging licks and prods, Jordyn just yelled at her to get off of her! Sneaky, just trying to take care of her young owner! No apppreciation, there! I was pretty happy when Jo sat up on her own (no broken back) and clearly her jaw was intact and working. While I would discover that Jordyn had road rash from her tiny cheek, down her shoulder, to her hip and on her arm, the most impressive thing was her helmet. Just recently we had moved up to this helmet as the fit was not right on her old one. If she hit the jump hard enough to implant the paint into the helmet, I sure do not want to ever see what her little head would have looked like without it. I am having visions of a squashed melon. i have always said after years working ER and in the medical field, you can fix anything but a broken brain. I know you have heard it before but here it is again–wear your helmet! Just do it. Do you want to have a squashed melon? I didn’t think so. Piper stood quietly by Jordyn as she laid on the ground. Jordyn got back on Piper and rode her around for a few minutes. The following day she rode her in the morning on her own and then with Dev for her lesson. Jordyn is a brave,courageous little girl. She was bragging to anyone that would listen about how she cantered all by herself. Oh, and she is very lucky, too! 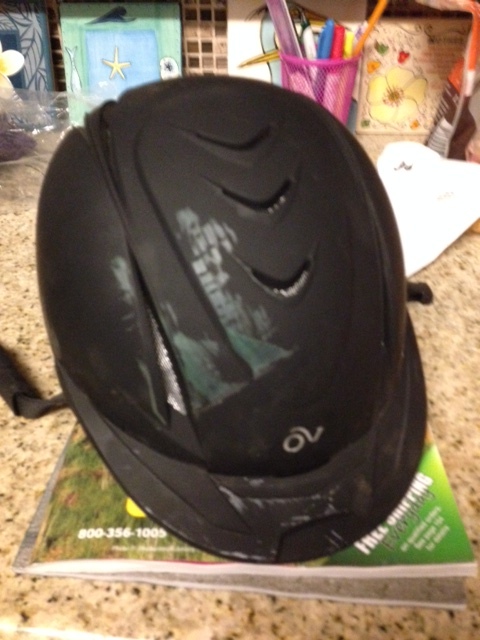 This entry was posted in A Piper Story, Family Life, Grandkids and tagged riding accidents and kids with helmets, Riding helmets, use of helmets with kids by Exechorseluver. Bookmark the permalink.